"Let it Go" At Disney Cruise Lines New Land of Frozen! Cruise News Disney Cruise Line "Let it Go" At Disney Cruise Lines New Land of Frozen! “Let it Go” At Disney Cruise Lines New Land of Frozen! 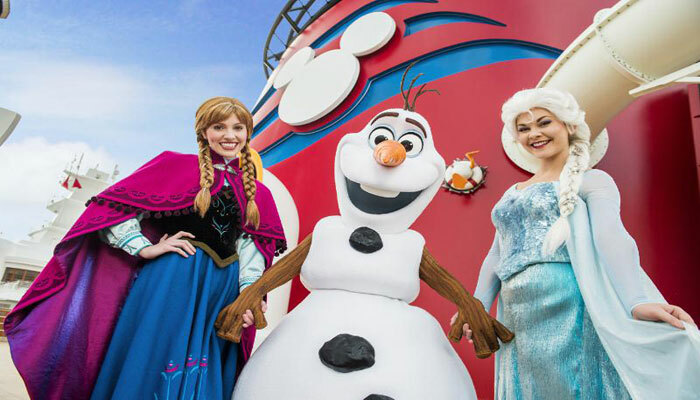 Disney Cruise line is bringing the popular hit movie “Frozen” to the ocean. Guests can experience everything the movie has to offer including the characters, a deck party and a range of onboard activities. The new land of Frozen will make it debut this summer on the Disney Magic and Disney Wonder as they sail Alaska and European cruises. Whats great about this new experience is that passengers will see the ship transformed into a Frozen like movie set. this includes the ships Atrium being totally transformed into a magical winter wonderland for one day. This will be the start of one special “Frozen” day onboard. Memorable moments with Anna, Elsa, and for the first time in forever, Kristoff and Olaf. “Anna’s Chase for the Chocolate” scavenger hunt for those who share Anna’s sense of adventure, with a special surprise for finishing the game. “Do You Want to Build a Snowman” activity where kids take on Elsa’s magical powers to make snow and ice. “The Maypole Swirl and Twirl” for families to learn a traditional Scandinavian dance spinning and braiding giant ribbons. “Frozen” themed dining experience, including a menu inspired by traditional Nordic fare and special dishes inspired by the film. In the evening the ship will come alive with a one-off special Frozen deck party. the Frozen characters will attend the magical event of “Freezing the Night Away with Anna, Elsa and Friends”. The entire family can enjoy their company and deck as it’s also transformed into a winter wonderland. there will be music and dancing for adults and kids joined by Elsa, Kristoff, Olaf and Princess Anna. On the Disney Magic the “Frozen” cast will debut in the ships Walt Disney Theatre. A new part will be added to the popular “Disney Dreams” production. none of the Disney ships will be left out as guest can meet and mingle with the Frozen cast onboard all the ships in the fleet. Also a new Summertime Freeze Bar will be featured on Disney’s private island Castaway Cay where chilled out non-alcoholic drinks are served. LET IT GO, LET IT GOOOOO… Oops sorry.